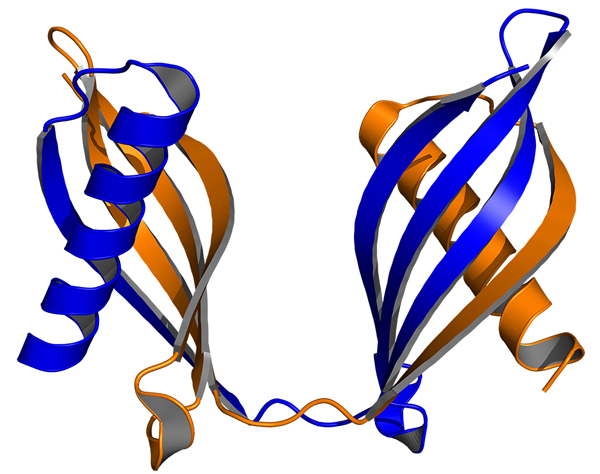 Proteinase inhibitors are proteins that regulate the fate of proteolysis in animal and plant organisms. Phytocystatins are plant inhibitors targeting cysteine proteinases from endogenous origins, like that encountered in papaya and pineapple fruits, as well as proteases from exogenous origin, like those from phytophagous insects, phytopathogenic fungi, parasitic nematodes and herbivorous animals. DNA sequences from cowpea leaves encoding phytocystatins were cloned and expressed in Escherichia coli. Fig. 1. Action of Cowpea cystatins over digestive enzymes of the bruchid beetles Callosobruchus maculatus and Zabrotes subfasciatus. VuCys1 and VuCys2 (0, 0.25, 0.5, 1 and 2 micrograms) were incubated with digestive enzymes isolated from the gut of 3rd instar larvae of both insects. The deleterious effects of Cowpea cystatins are expressed as a percentage of inhibition of larval enzymes. 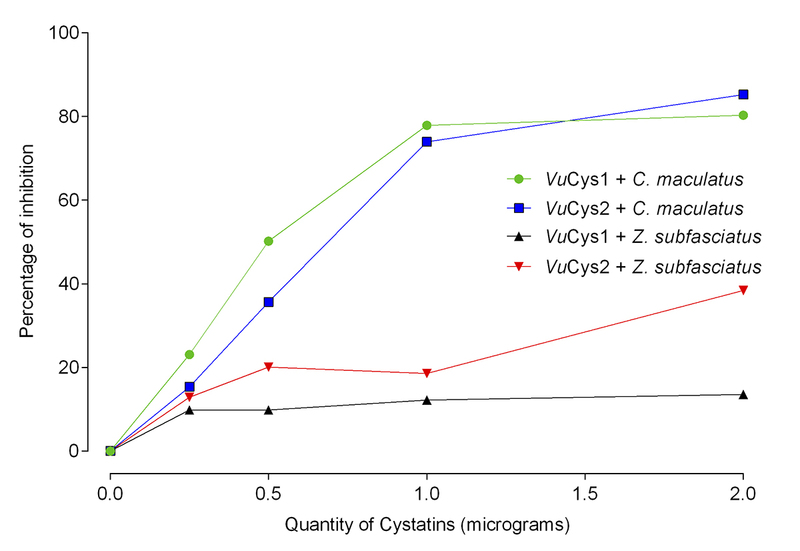 Recombinant proteins were purified to homogeneity and presented molecular masses of 14 kDa (single-domain cystatin, named VuCys1) and 26 kDa (two-domain cystatin, called VuCys2). Cowpea cystatins were active against a number of commercial cysteine proteinases, including papain, chymopapain, bromelain and cathepsin B. Inhibition of these proteases by VuCys1 or VuCys2 ranged from 100% (papain) to 9-12.5% (cathepsin B). The bruchid beetles Callosobruchus maculatus and Zabrotes subfasciatus are two major pests of stored cowpea seeds. Therefore, we tested the ability of recombinant cystatins to inhibit proteolytic enzymes isolated from midguts of 3rd instar larvae of both insects (Fig. 1). VuCys1 and VuCys2 presented a maximum inhibitory effect of 80.3 and 85.3%, respectively, over C. maculatus enzymes. On the other hand, the highest inhibition percentages over Z. subfasciatus enzymes were much lower, 13.5% (VuCys1) and 38.4% (VuCys2). This differential activity may be explained by the predominant types of proteases used by each beetle to digest dietary proteins. High levels of cysteine proteinases are found in the midgut of C. maculatus larvae, whereas in Z. subfasciatus, larvae use mainly aspartic proteinases to breakdown proteins into peptides. In addition, we suppose that Z. subfasciatus larvae may constitutively express cysteine proteinases refractory to cowpea cystatins. Based on these findings, we decided to verify the effects of VuCys1 and VuCys2 on larvae of C. maculatus in a feeding bioassay. Contrasting to the in vitro tests, the feeding assay did not show any difference on larvae mortality, growth and development when compared to insects reared on control seeds. Fig. 2. Overview of the three-dimensional structure adopted by two VuCys1 monomers, as observed by x-ray diffraction analysis. The structure was solved at a resolution of 1.95 Å and deposited at the protein data bank (PDB) under the accession number 4TX4. 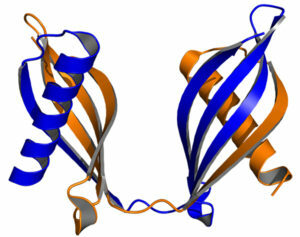 The two monomers (represented in blue and orange) interact together through a typical domain-swapped dimer (DSD) arrangement. This arises the question if C. maculatus larvae had adapted and altered their proteolytic enzymes when challenged with cowpea cystatins by expressing cysteine proteinases capable to surpass their inhibitory effects. Indeed, it was previously demonstrated that when C. maculatus larvae were exposed to a soybean cystatin (soyacystatin), they were able to produce a Cathepsin B-like cysteine proteinase whose enzymatic activity was not affected by soyacystatin. Both cowpea cystatins were very stable when subjected to extreme values of temperature (100 ºC up to 60 min) and pH (from 2.2 up to 11.0), showing only minor decreases on their inhibitory activities over papain. Moreover, circular dichroism (CD) demonstrated that only slight perturbances on the secondary structure spectra of both proteins occurred when heat and pH treatments were simulated during CD studies, supporting the biochemical observations. The crystal structure of VuCys1 was solved at a resolution of 1.95 Å by x-ray diffraction (Fig. 2) and revealed an interesting three-dimensional folding pattern, typical of a domain-swapped dimer (DSD). Each monomer of the dimer is composed by a central, five-turn α-helix enclosed by an array of antiparallel β-sheet strands. VuCys1 DSD presents two lobes that are in a more intimate contact than that observed for DSDs of other cystatins, and this allows the recruitment of water molecules by neighboring polar amino acids, creating a hydrogen bond network. To our knowledge, this is a feature not yet described for other cystatins exhibiting DSD. Furthermore, a hydrophobic core is created due to the proximity of the two lobes. The hydrogen bond network in conjunction with the small hydrophobic core may explain the remarkable tolerance to extreme temperatures and pH conditions presented by VuCys1. 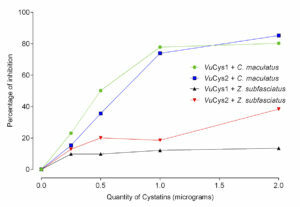 Expression in Escherichia coli of cysteine protease inhibitors from cowpea (Vigna unguiculata): The crystal structure of a single-domain cystatin gives insights on its thermal and pH stability.